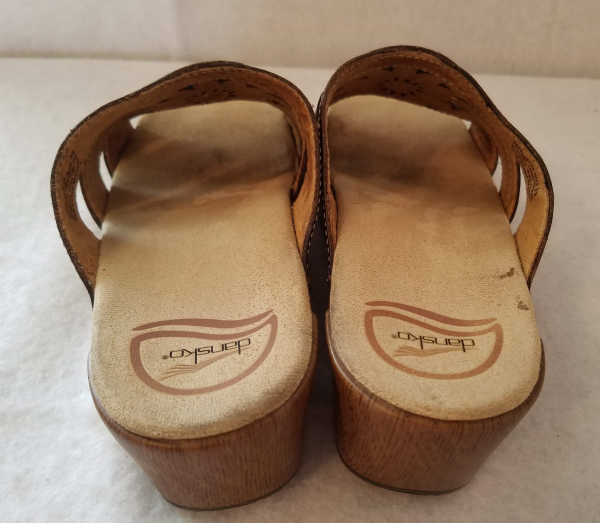 Nothing decreases the value of an otherwise nice pair of sandals like toe, heel and foot marks on the insoles. Such marks on your own shoes make them look worn and dirty if you slip off your sandals at the pool or beach. 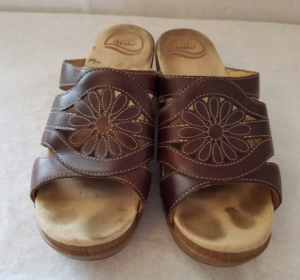 Heel, toe and foot marks on pre-owned sandals for sale decrease the value and make them much harder to move. They might look like permanent foot imprints, but they’re really just ground-in dirt and stains. 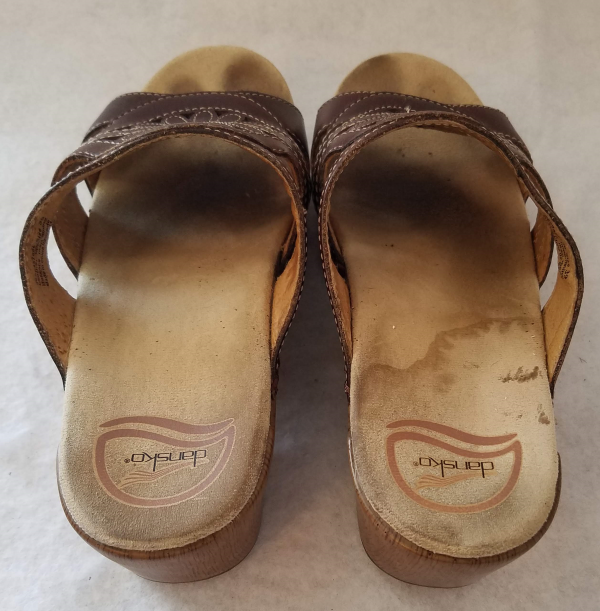 They can be challenging to remove through standard shoe cleaning methods because the grime has been pushed down into the cloth fibers of the insoles repeatedly over time. Fortunately, with the right materials and about 15 minutes of time, you can probably erase most of those hideous marks. First, try the cleaner on a small spot on your sandal insoles to make sure it doesn’t cause any unexpected results. 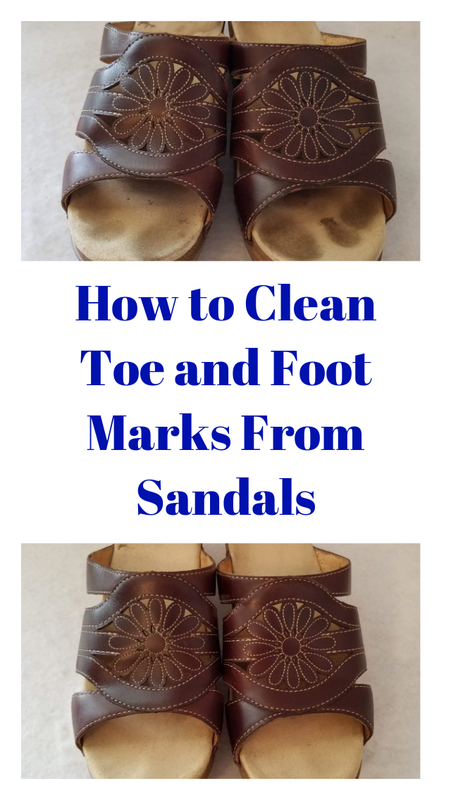 Spray the stained insoles of your sandals thoroughly with the cleaner. Be sure to spray them until they’re visibly wet, but don’t submerge your sandals in water or any liquid. Let the cleaner soak into the shoes for a couple of minutes, but don’t allow them to dry. Wet the toothbrush under running water. Scrub the dirty insoles like crazy with the old toothbrush. Clean the toothbrush under running water every few minutes to make sure you’re not rubbing dirt back into the shoes. When the sandals start to look clean, rub the newly scrubbed surfaces with the cloth. Wash the toothbrush under running water and scrub the shoes again, then rub them with the washcloth again. Keep repeating this process until you’re no longer rubbing dirt onto the cleaning cloth. 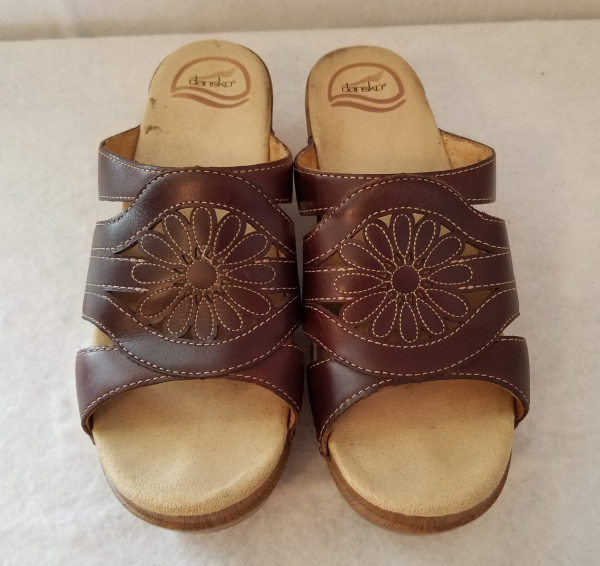 You’ll be amazed at the difference in how your sandals look when you’re finished! Well-clean sandals. I did not expect such an effect. Hi Beth, you are a lifesaver! I just tried your method on my favorite pair of flip flops and it worked like a charm! Hey there! I actually tried this and it works amazing! Thank you so much! This is awesome! I hate those dark spots from toes and heels. I am definitely going to be trying this on vacation before pool season starts again. Thanks!! Thank you for sharing these tips. I was actually searching for how to clean regular tennis shoes but i really do think i can use the info just the same. That insole print is truly a root problem why I hesitate to take off my sandals at places. Thanks to your article. Now I m gonna try this new trick this weekend. Giving them a good scrub! OMG….this is great. Usually when my shoes get like that they get moved to the back of the closet where they’ll stay until they go out of style. OMG! I thought that couldn’t be fixed! Thank you! Very helpful post……I will apply these tips for sure. Thankyou soooo much for sharing!!! Can’t wait to try your technique, Beth. Thank you for sharing!